Our expectation for exemplary behaviour, both in and out of school, is reflected in our expectation of uniform compliance. We expect and trust that parents and carers, students and staff work together to promote fairness and consistency and to prevent valuable school time being diverted to following up on breaches of uniform policy. Our uniform was designed with the distinct purpose of differentiating between leisure and learning time. It was chosen to foster a smart image for students and to encourage them to be ready to focus on their work, free from distractions. We strive to support our students to develop themselves academically and socially and prepare themselves for life after school where a dress code or other restrictions may be expected. A uniform also helps us to dilute the status placed on expensive clothes or labels and challenge the belief that we are defined by what we wear. Instead, we encourage individual beliefs, ideas, passions and wellbeing and an ethos of camaraderie that is reflected in this shared experience. Whilst wearing Priory uniform, all students are ambassadors for our school and we hope all our students take this responsibility seriously. Wearing our school uniform properly demonstrates a commitment to our high standards of conduct and support of our shared values. We hope it indicates a sense of loyalty to one another and a commitment to look after what we have, our buildings, our equipment and our environment. It encapsulates our pride in our school community. We believe that a uniform worn without modification is the best way to ensure equality. We do not want children feeling vulnerable and stressed by the pressure they feel to wear or own the latest trend or status symbol. We strive to shift the emphasis of competition and status, to create a feeling of oneness and of support for fellow students. By adhering to Priory’s uniform expectations, students have a more positive experience at school and therefore a better chance to excel. This uniform has been designed specifically in response to the many issues and suggestions raised by parents, students and school staff. Specifically, it addresses the current issues of inequality and decency. We hope that it will provide a smart, comfortable and affordable alternative to the current uniform. The new update consists of shirt, tie, school jumper and trousers. This is a gender-neutral uniform to be worn by all students. We have also responded to the issues raised in the hotter months and created an alternative summer uniform. During this hotter period, the shirt, tie and jumper may be substituted for the school polo shirt and trousers. In extreme heatwave conditions, to help students stay cool and comfortable, students and parents will be notified by the school, that PE shorts or PE skorts, may be worn instead of school trousers. Summer uniform will be permitted during term 6 only. Should extreme hot weather occur at other times school staff will communicate with students and parents and a message will be displayed on the school website. Extreme weather alternatives will also be communicated in this way. We hope this uniform addresses the suggestions and concerns that have been raised, whilst maintaining the high standards which are embedded within our school values. Please note: there is no expectation for current students to adopt the updated uniform. 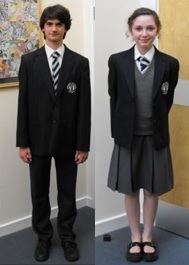 Existing Priory students may choose to continue wearing their current uniform, in full, with the blazer, for the remainder of their time at Priory, or to adopt the new, updated uniform. Student who out grow their uniform will need to update to the new uniform as our supplier no longer stocks the blazer or skirt. Students will not be permitted to wear a mixture of old and new uniform. Students choosing to continue to wear the current uniform, may still purchase and wear the summer uniform if they wish. We hope to have samples available in school and at the Intersport shop in Lewes, as soon as possible. The Intersport team will be selling the new uniform in school on the evenings of Monday 17th and Tuesday 18th July between 4.00pm and 6.30pm. All families are welcome. 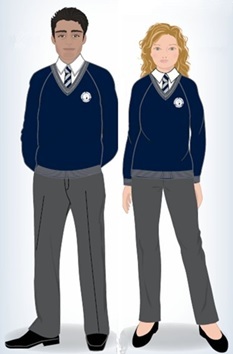 If parents are in any doubt about the suitability of an item of uniform, they are advised to contact the uniform supplier, who can provide advice. Alternatively, please feel free to contact your child’s House Assistant at the school. The school now has a second-hand uniform shop consisting of good condition uniform all priced between 50p and £2.00. All enquiries should be made via the school Reception. The uniform shop will be available most days during morning break and after school at 3.15pm, as well as at most parents’ evenings. From September 2017 onwards, all new Priory Students are expected to purchase the updated uniform as documented below. • Navy blue jumper with Priory School badge purchased from our suppliers. • Blue and silver grey striped Priory School tie purchased from our suppliers. • Plain white tailored shirt or blouse, long or short sleeved, no logos. Polo shirts are not permitted. • Grey school trousers. Formal, suit-like trousers, no fashion trousers, chinos, jeans nor cargo pants. • Plain black, grey or white socks. • Totally black, flat shoes (not boots) with no additional colour whatsoever, eg: no coloured panels, stitching, laces, logos, eyelets or other embellishments. • Students wishing to wear a belt should ensure that it is a discreet, simple, thin, plain, black or grey belt only. • Navy blue polo shirt with Priory School badge purchased from our suppliers. • Grey school trousers. Formal, suit-like trousers, no fashion trousers, chinos, jeans or cargo pants. • Totally black, flat shoes (not boots) with no additional colour whatsoever. Eg: no coloured panels, stitching, laces, logos, eyelets or other embellishments. Students are only permitted to wear a watch and one pair of small stud ear-rings. Please note: body piercing of any kind is not acceptable and must be removed before coming to school. We do not wish to discourage individuality with regard to hairstyle, but request that extreme styles, bleaches or dyes that are in blatant contrast to natural hair colours are not worn. Any student considering a change of style is advised to speak with their House Assistant before doing so. Should students wish to wear make-up, they must ensure that it is discreet and natural. For the journey to and from school, and for break and lunch times, it is recommended that students bring a warm, waterproof jacket. This can be stored in the student lockers or carried with them during the day. Hooded tops should not be worn on the school site. • Navy blue blazer with Priory School badge purchased from our suppliers. • Plain white tailored shirt. May be long or short sleeved but no logos. Polo shirts are not permitted. • Blue and silver grey striped Priory School tie. • Trousers – mid-grey formal, suit-like trousers. No fashion trousers, chinos, jeans or cargo pants. • Plain white tailored shirt without logo or extra details. May be long or short sleeved. No polo shirts. • Approved Priory School skirt from uniform suppliers (please contact suppliers for exact details) or mid-grey formal, suit-like trousers. No fashion trousers, chinos, jeans or cargo pants. • Plain black, grey or white ankle socks or plain black, grey or skin coloured tights. Girls are permitted to wear ankle socks over tights if they are indistinguishable in colour. No leggings or footless tights. • V neck mid grey school knitwear to wear under the blazer. Knitwear may be long-sleeved, sleeveless or school cardigan. No logos are permitted. • Sky blue polo shirt with Priory logo purchased from our suppliers. • Priory reversible Rugby shirt purchased from our suppliers. Please note that leggings are not permitted for P.E. Dealing with uniform issues detracts from our core purposes as a school: learning and teaching. Parents are urged to ensure that their child is sent to school in correct school uniform. Where there is a genuine difficulty in sending students to school in correct uniform, parents are advised to contact their child’s House Assistant. Students who need to borrow items of uniform should report to their House Assistant no later than 8.25 in the morning. • Students are expected to report to their House office immediately. • Students are expected to work with their House team to find a solution. • House teams will attempt to lend a suitable item if they have it. • House teams may call home to request suitable items are brought in. • Students could be requested to work outside their House office until the matter is resolved. • Parents may be liable for any borrowed uniform that isn't returned. • Loss of social time. • In extreme circumstances, students may be excluded from school for persistent defiance of the uniform rules. • Existing students, who persist in wearing the old style uniform incorrectly, could be expected to adopt the new uniform in order to resolve specific issues.